We can all probably agree that while Amal Clooney's work as a highly accomplished international human rights lawyer is most important, her exciting sense of style is another topic the world can't resist talking about. Something we admire most about her fashion choices is her willingness to try bold trends during her off-duty hours. Her professional looks are always polished and appropriate, but she even manages to have fun with her wardrobe while she's on duty, often via color and accessories. She's clearly a fashion girl through and through, which explains the world's current attentiveness to everything she wears, especially now that she's expecting twins with husband George Clooney. While there are quite a few things Clooney does wear (at least once), we've been keeping tabs on the items and trends she almost never touches. It's always interesting to see what celebrities with the world of fashion at their fingertips choose to avoid and why—and what they wear instead. Want to join us as we take a thorough look into Clooney's wardrobe, just as we recently did with Olivia Palermo? Read on to find out what the nine things are that Amal Clooney never wears, and shop what she's wearing instead! You'd be hard-pressed to find an instance of Clooney wearing something as athleisure-based as leggings. While she has been known to style leather pants for a night out, for the most part, she favors jeans when off the clock. On Amal Clooney: Alice and Olivia jeans. While Clooney certainly doesn't discriminate against shoe trends, she spends much of her time wearing professional looks that are appropriate for her career as a high-powered attorney. Accordingly, you'll often find her in pumps as opposed to more casual loafers and ballet flats. On Amal Clooney: Bottega Veneta dress and coat; Salvatore Ferragamo bag. When it comes to top styles, the Brit isn't one to reach for a casual plaid shirt. What you will often find her in is a polished combination of a silk blouse and blazer. On Amal Clooney: Dolce & Gabbana suit; Paul Andrew Zenadia Pumps ($645). Although the oversize look is certainly having a moment, Clooney's wardrobe consists of flattering pieces and matching sets that are versatile enough to go from the office to a night out. 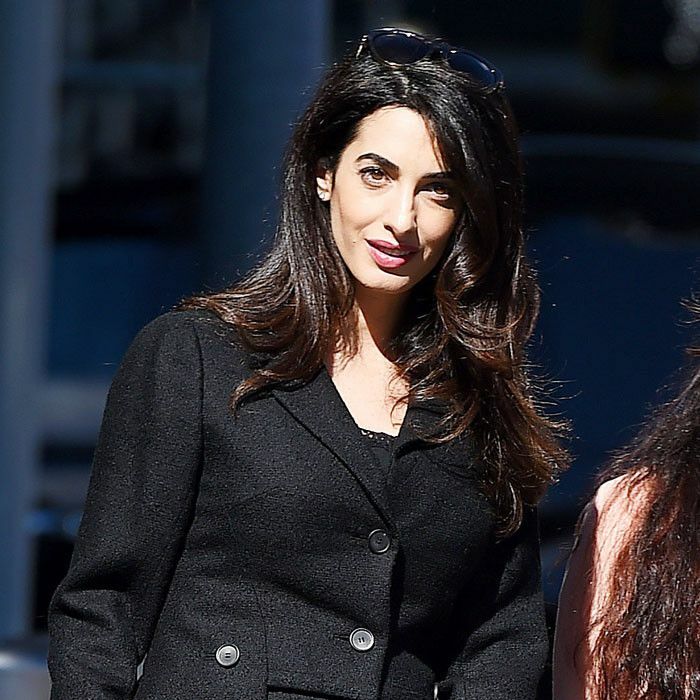 On Amal Clooney: Bottega Veneta coat, dress, and bag. The graphic tee trend likely won't make it into Clooney's closet, but she loves to experiment with printed trousers and is a master at mixing them with other printed pieces. On Amal Clooney: Elizabeth and James sunglasses; Altuzarra coat and trousers. We also love this Topshop pair. Sneakers definitely aren't Clooney's footwear style of choice, but she loves boots of every style, height, and trend. On Amal Clooney: Adam Lippes coat; Alberta Ferretti Sunday Jumper ($495). The hoodie trend may not suit her aesthetic, but Clooney wears statement-making outerwear on repeat. Bold colors, prints, dramatic lengths—you name it. We couldn't agree more that a third piece is the easiest way to add instant polish to a look. We love the mini bag trend but can certainly admit that it's not the most practical handbag style, especially for someone as busy as Clooney. Accordingly, she usually has a large structured tote or satchel on her arm. On Amal Clooney: Maison Margiela bag. Surprisingly enough, we couldn't find any instances where Clooney's worn a scarf, whether for warmth or as an accent piece. But one accessory she frequently reaches for is a pair of oversize sunglasses, which likely come in handy when the paparazzi follows her every move. On Amal Clooney: Valentino coat, dress, bag, and boots. Next up, take a look at the Amal Clooney way to wear a T-shirt and jeans.